There has never been but one religion, nor has it ever been absent from the world since time began. According to Islamic belief, many prophets have come to humanity throughout its history, and all have preached the true religion of the One God. None of these preached anything else, so that there can be no contradiction between their original teachings. Due to either entropy or Murphy’s Law, however, these pure teachings became corrupted with the passage of time, so every so often, a new prophet appeared to correct the course. If we understand the word Islam in the sense of “surrender to God,” or more generally of monotheism, there is nothing strange in saying that Judaism was the Islam of Moses, Christianity was the Islam of Jesus, and so on. Again according to Islamic belief, the repetitive appearance of prophets was not simply a return to the original teaching, but an actual upgrade, the revelation of something new. As humanity progressed from infancy toward emancipation, new information was revealed—at a higher turn of the spiral. This was commensurate with the ability of humankind to digest it, just as an infant is weaned away from milk to other kinds of food as it grows up. Finally, with the emergence of Islam, this growth process was complete, and there being nothing further to add, that was the end of prophethood. During the long stretches of time when a prophet did not arrive, humanity frequently regressed to a state of polytheism, if not outright atheism. Even then, however, the monotheistic ideal was not entirely forgotten. People either recognized one god as supreme, as Zeus (Theos) was with the Greeks, or assigned supremacy to a different god at different times and places, as was the case with the Egyptians. Now every religion has two components in general, with varying emphasis placed on each according to the case being considered. One has to do with external regulations, observations and worship: this is the exoteric component. The other involves inward experience, psychological states and spiritual progress. This inner dimension is called esoteric. Note that the exoteric is usually for the masses, while esotericism appeals to the few, the Elect. In Islam, the esoteric component is known as Sufism. But if earlier religions were earlier incarnations of Islam, it would follow that earlier esotericisms must have been earlier incarnations of Sufism. And thus, even when people strayed far from the ideal of monotheism, residues of true esotericism must have survived. It then remains for us to identify and clarify these. It is with this in mind that I now propose to look at the polytheistic religion of ancient Egypt, through the medium of its art. (There were 1400 deities according to one claim, “thousands” according to another. This excludes the monotheistic “Amarna religion” of Akhenaten, which lasted about 20 years.) Of course, most people accept that ancient Egyptian religion was nothing if not symbolic. But can we identify elements therein that are also present in Sufism? Though we no longer need to refer to that wisdom, it may be instructive to observe the continuity. The ancient Egyptians were preoccupied with the afterlife. Their entire culture bears testimony to this fact. But if we recall the Sufi precept, “Die before you die,” then the big picture takes on a whole new meaning. In that case, we realize that not simply the deceased, but living adepts, may have been on their minds. The elaborate rituals, invocations and prayers may have been intended, at least in part, for inducing a death-rebirth experience in the living human being. The Base Self (nafs al-ammara) is our inner demon that lurks inside each of us, silently plotting our downfall. More information on the Base Self is available elsewhere on this website (here), or here. But how can we be sure that the person is fighting the internal principle of evil (the Base Self) and not the external principle of evil (Satan or some equivalent)? The drawing on the right shows a snake with human legs and feet. Indeed, the Egyptians depicted their deities with human bodies and animal heads, indicating an awareness that human personalities could take on some of the characteristics of these animals. 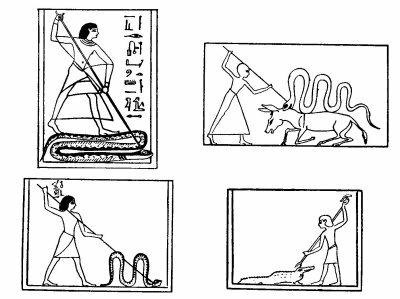 Customary Interpretation: The four pictures at left show Apep, a huge serpent (or crocodile), an Egyptian monster living in perpetual darkness. 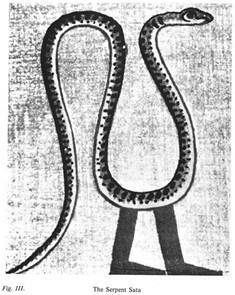 Apep is the personification of darkness, evil, and chaos, and thus opponent of light and Ma'at (order/truth). Ra was the solar deity, bringer of light, and thus the upholder of Ma'at. Apep was given the title “Enemy of Ra.” (Wikipedia, “Apep.”) The Greek equivalent of Ra was Apollo, from a-pollon: “not-many,” implying One. The Sufis have traditionally considered that the Base Self is merely the basement level, or starting point, of the evolution of the self. As I have elaborated elsewhere (especially in The Station of No Station (2001), Chapter 4), the Sufis consider that there are seven or nine levels of selfhood (nine, if the seventh is “exploded” into three). These are: 1. the Base Self, 2. the Critical Self, 3. the Inspired Self, 4. the Serene Self, 5. the Pleased Self, 6. the Pleasing Self, 7. the Perfect(ed) Self. Each of these represents a higher level of purification of the self (nafs). The last, with the highest level of purification, is difficult to conceive of in ordinary human terms. The others are intermediate stages leading to that goal. Under the prostrating figure are depicted seven different crowns. Each of these could well be conceived as the crown of a different station of selfhood. From a Sufi perspective, the following drawing is even more interesting. It shows a person on every one of nine steps. 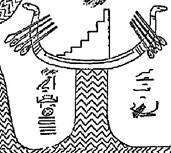 The Egyptians also depicted a stairway of seven steps (see examples given below). A Sufi might read this picture as follows: at every instant, one stands in judgment before God, as shown by the human figure with scales (about which more below). As s/he is progressively purified of the principle of evil—or Base-Selfhood—(shown by the pig in the boat being driven away), s/he progresses to the next level, or station. In this case, the persons on the stairs each represent a higher stage of one’s own self-purification (and hence, self-development). They depict, not different individuals, but different stages for the same person. Customary Interpretation: The nine gods of the Ennead occupy the steps. Set or Seth is a god of the desert, storms, and foreigners (thus, of fearful things) in ancient Egyptian religion. In later myths he is also the god of darkness and chaos. 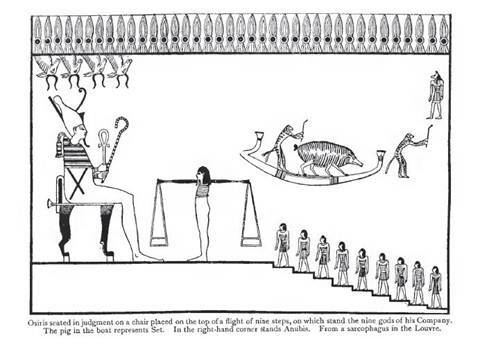 He is represented by the pig being driven away from the presence of Osiris. The weighing of the soul represents the most critical stage in the progress of the deceased in the Afterworld. Here, in self-defense, s/he engages in the famous Negative Confession: “Not have I sinned, not have I wronged another…” and so on. The jackal-headed Anubis weighs the heart of the deceased (red pot) against the feather of Truth (Ma’at, al-Haqq in Sufism). The ibis-headed Thoth keeps record. The heart must be light as a feather, free of any sins or excrement that weigh it down. If his heart exactly equals the weight of the feather, the deceased is allowed to pass into the afterlife. If it is heavier, he is eaten by the waiting chimeric devouring creature Ammit, composed of the deadly crocodile, lion, and hippopotamus. In Islam and thus also in Sufism, scales again play a role. A person’s sins are placed in one scale, his virtues or merits on the other, and weighed against one another. If the virtues outweigh the sins, one is allowed to pass into Paradise. One of the most important events in the Prophet’s life was the mystical journey he embarked on circa 621 AD. He was raised through the Seven Heavens to reach communion (if that is the right word) with God. At each level, he was greeted and allowed entry by the guardian of that level. This was also the occasion on which Formal Prayer, one of the Five Pillars of Islam, was bestowed on humanity as a gift, so that everyone could experience their own personal Ascension. As the Prophet said: “Formal Prayer is the Ascension of the faithful.” Even if one does not experience it in the full clarity of consciousness, the ritual Prayer of Islam is the primary method for drawing near to God. Those who continue this Prayer for a long time are distinguished by their peacefulness and serenity. There are various claims as to the mode in which the Prophet’s Ascension occurred, and also as to its repetition. Some say it happened both in body and spirit, some say only in spirit. Again, there have been claims that the Prophet Ascended 33 times during his life, others say he was always at that level after the first and famous Ascension. Concerning these we frame no hypothesis—all of them are acceptable to us. The ancient Egptians believed that the soul of the dead ascended from earth to heaven on a ladder, as depicted above right. 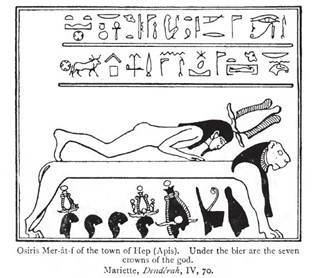 They conceived of Paradise as having Seven Arits, or divisions of Sekhet-Aaru (Elysian Fields, abode of perfect spirits) corresponding to the Seven Heavens. Each Arit had its door, or gate, which was guarded by a gatekeeper, by a watcher, who reported the arrival of every comer. Various images above show Ra’s magical boat (solar barque) with the flight of steps, representing the primeval hill where Ra had been born. The seven steps found on each would correspond to the seven levels of selfhood in Sufism, as well as to the Seven Heavens. They also resemble the pulpits to be found in mosques, some of which actually have seven steps. Of course, every such pulpit (minbar) is a symbol for the miʿraj: “the minbar’s symbolism…corresponds to the ladder of the worlds… The fact that the [top]most level of the minbar, the throne sheltered by its canopy, remains empty…represents…the unseen presence of the Divine Messenger.” (Titus Burckhart, Art of Islam, p96.) That would correspond to “the Station of Praise” (maqam al-mahmud). The first letter of God’s Name of Majesty (Allah) is alif or aleph, A. In form, alif also depicts the numeral 1 in various cultures, underlining the fact that God is One. As René Guénon points out in Symbols of Sacred Science, alif represents the World Axis (p270n19)­—the Axis of the Universe, also known variously as the Tree of Life, the Cosmic Mountain, the Ray of Creation, etc. 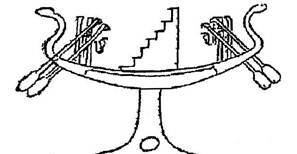 It is associated with the Navel of the World (omphalos) and with the concept of Pole (qutb). It is the axis that connects Heaven and Earth. Martin Lings equates the alif with the erect human body when he says that “the body stands for the Axis of the Universe which is none other than the Tree of Life.” (What Is Sufism, p84.) Indeed, in pictures of Islam’s Formal Prayer (salat / namaz), the standing position (qiyam posture) is depicted by the letter alif. Again according to Guénon, the “Straight Path” (es-sirâtul-mustaqim) in Islam is the same thing as the vertical axis in the upward direction, since the root word denotes verticality (qam, “to raise oneself”) (The Symbolism of the Cross, p113). 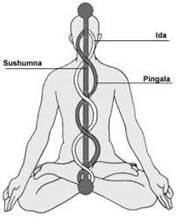 In Kundalini Yoga, the Axis of the Universe is the nadi (etymologically “water path”) called the Sushumna (its name in Taoism is Chong Mai). 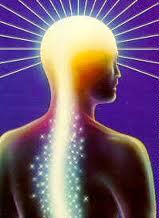 This is the channel corresponding to the human spine in the Subtle Body. In accordance with the Hermetic principle: “As above, so below,” it is thought that the macrocosmos is mirrored in the microcosmos (namely, in Sufism, the human being). Others have already remarked the parallels between Kundalini and the Djed (or Tet) column in ancient Egypt (e.g. see Wikipedia entry for Djed). 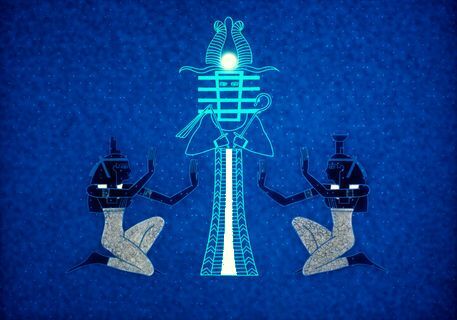 The Djed pillar is the spine of the human being and of Osiris, god (I prefer the Jungian term “archetype”) of the Underworld, death and resurrection. The Egyptian Book of the Dead identifies the pillar as both the backbone of Osiris (Ch. 155) and the support of the universe. It is indicative of stability. As the cosmic axis, the Djed is a cylinder, a column of light. It is the seat of the “magic fluid,” and the Axis of the Universe. Interestingly, scientists have recently found indications that the physical universe may also have an axis. Regularities in the Cosmic Background Radiation, as well as a study of 15 thousand galaxies, have led them to this view. So: beneath their all-too-obvious polytheism, did the ancient Egyptians hide a secret system that spoke of perennial truths, that even today corresponds to valid elements in Sufism, which only initiates were made privy to? Or was it polytheism all the way down? I have presented some of the pictorial evidence. You be the judge. Meanwhile, we have enjoyed an excursion into Sufi concepts, using material from ancient Egypt. Certainly a thrilling ride!